Kenya's Capital Markets Authority (CMA) on Tuesday announced it granted approval for the cross-listing of Bank of Kigali Group Plc's shares on the Nairobi Securities Exchange (NSE). The decision means that investors will be able to access Bank of Kigali shares on the Nairobi bourse. The Group's shares are currently listed on the Rwanda Stock Exchange where it has been trading since 2011. The statement of approval from Kenya's capital markets regulator comes a day after the bank officially launched its long-awaited rights issue.The bank started to sell 222.2 million new shares to existing shareholders, seeking to raise Rwf60 billion to finance its growth strategy. 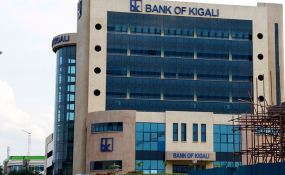 Bank of Kigali Group, a holding company of Bank of Kigali Plc, BK Insurance, BK Capital and BKTecHouse, will officially start trading on the Nairobi Exchange from November 30. The Chairman of the East African Securities Regulatory Authorities (EASRA) and Kenya's CMA Chief Executive, Paul Muthaura, lauded the new listing, saying that it will play a role in fostering progress towards the development of East African Community single market in financial services. He said the cross-listing will particularly facilitate cross-border investments, further strengthening the agreement entered into between capital markets regulators in Kenya, Uganda, Tanzania, Rwanda and Burundi. These East African countries entered a memorandum of understanding as part of their commitment to integrate the East African capital markets. Muthaura highlighted in the statement that the cross-listing of the issuer on the Nairobi Securities Exchange is expected to address challenges BK Group faces in Rwanda, due to the small size of the capital markets. "It will unlock liquidity constraints and provide access to a wider pool of investors," he noted. Investors are also expected to benefit from the opportunity to participate in the diverse income streams of BK Group and its future capital growth.